The referendum in Ecuador: a lesson to drive change? There is no citizen trust that can resist an election delay. This complicated scenario was lived in Ecuador, after the referendum held in May 7th, when the definitive results were known 12 days later. The delay, along with the inconsistencies and irregularities in the computation of 7000 urn- the number of votes did not coincide with the number of voters-, as well as the information detached from the quick count of the National Electoral Council (CNE), that drastically reduced the projection made in the exit poll survey. Ecuador has a 100% manual electoral system, which has gradually shown signs of exhaustion in maintaining the cleanliness of the process, as well as providing the certainty that that every vote exercised by the citizens qre counted accurately. The political class, on all sides, has expressed dissatisfaction with the way it has completed the count of votes, and even cast doubt on the veracity of the results. Examples abound, the night of the referendum on Ecuador’s President Rafael Correa despite proclaiming victory in the 10 items surveyed stating that “Yes” won 62% of the votes, versus 38% of “No”, accused several provincial courts to “manipulate the record’s entry”. In turn, Clever Jiménez, Pachakutik indigenous party assemblyman, said he was concerned about the counting because he distrusted the CNE, as he was signed as being under the influence of the Executive. From then until 12 days later, the bickering became the order of the day. While the results dictated that the “Yes” won in eight questions, but not with the great difference wielded by the president, on the other two of the most controversial questions, because it called for the empowerment to reform the judiciary and regulate press, the difference was minimal at a time, and in others, the “No” took the lead. Although the “Yes” was the winner, the report issued by the Organization of American States (OAS), one of the multilateral organizations that acted as an observer of the referendum, prays that “we have no evidence of fraud, what we do have is evidence of significant inefficiencies in the count”. The events during the two weeks could not be more eloquent for the whole country. However, the need to provide the Ecuador of a modern electoral system that allows quick, clean and safe elections, was not among the topics discussed by political actors in the midst of the tension. It is there when citizens must take the word. Electoral system reform is a legal mandate since 2008, and even that year the adoption of the technology used by Venezuela, provided by Smartmatic to partially technify suffrage was considerated. But until now, the need to transform has not gone hand in hand with the will. The referendum can be a lesson for Ecuador, and in the near future, we will know if the country is willing to take what they learn to drive change. Voting is the most direct way of expression in an election. By automating the process, some definitions and perceptions regarding the validity of votes have created, because unlike the manual vote, to blank vote may not be an option for voters. Typically, the charges at issue in the election are presented, either on paper ballots, voting machines or electronic cards, with the candidate’s name and party when it comes to single-member voting, or simply the political organization to allude the type list vote. When the election is larger, as a presidential one, it’s usually indicated the name of the candidate’s party and his or her photograph. It’s easier to exercise in a manual system, the nullity of the vote and even the protest mode known as blank votes, because the voter can vote several times for the same position, inadvertently or intentionally, generating invalid ballots. The voter can also leave the ballot unmarked to produce a blank vote. However, to generate invalid or blank votes in automated systems, other factors come into play, but the most determining factor is the electoral law. To make viable the null vote, the majority of countries with automated election system take into account the time given to the voter to exercise his or her right or duty. A case that illustrates this approach is Venezuela, which while blank vote is not allowed in the country, a period is granted, renewable once, for each citizen to vote. The Organic Law of Elections states that when the period expires and it’s extended, the voter that has not marked any option will be marked as if he or she issued a blank vote. The instruction number 4 of the Act provides for other reasons and mentions the lack of votes in the option list or vice versa, and also in a multi-member election if the voter selects a number of positions inferior to the number than must be chosen, the options that are nor marked will become blank votes. The selected options will be considered valid. Brazilian legislation enables the two modalities. In this country, in addition to select the candidates, there is a box dedicated to the blank ballots, making it possible to vote in this way. As for the null vote, it can be done intentionally or by mistake, since the Brazilian machines, which have a numeric keypad to type in the numbers of the postulate of choice, if the wrong number is typed, the machine will recognized it, generating one invalid ballot. There are other ranges of the two voting options in countries that have not automated their elections, but are on the way to doing so. 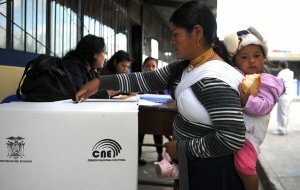 In Peru, Mexico and Colombia, the blank vote is valid, although in the first two countries they are not counted, but in Colombia they are considered and can have political influence. In that nation, the law gives legal significance because they may force the repetition of an election. This is referred to in Article 258 of the Colombian constitution, which clarifies that when the blank votes constitute a majority of all votes cast to elect members of a public corporation, governor, mayor or the first round of the presidential elections, election should be repeated once. It even warns that in the case of one-man election (governor, mayor, president in the first round) the same candidates may not appear, while in the elections to public corporations the lists that have not reached the threshold minimum voting may not be presented. When talking about electronic voting, voting machines are the undisputed protagonists, as they faithfully represent how technology can facilitate, but also strengthen, the electoral process. These tools are electronic devices capable of recording the votes, so they can be reliably counted. Currently there are multiple variants of voting machines in the market. The voter may express his or her vote either by an operation of a panel with buttons, marking on paper and then scrutinizing the vote electronically, or by choosing his or her options directly on a touch screen or electronic ballot. In Venezuela, the selection of the candidate can be done through an electronic ballot system or touch screen, depending on the number of contenders. The voting data is encrypted and stored on fixed and removable memories that are in the machines provided by Smartmatic. They issue a proof of vote and allow secure data transmission to the national aggregation center and finally, the results can be published automatically on the Internet. An example of the voting machines used in Venezuela are the models SAES-3000, and SAES 3300 and SAES-4000, which record the votes, they allow automated counting, without intervention of any external medium, and transmit election data. The stored data does not include a sequential order. For the machine, the elector is anonymous; there is no way to associate the will of the vote. Moreover, to ensure subsequent audits, they give the opportunity to reprint the paper ballots. 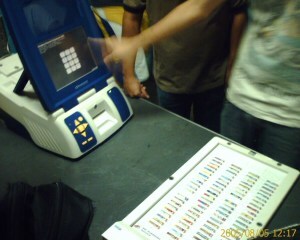 In Brazil the biometric voting machine is used, which allows the identification of voters through fingerprints. Voting equipment, developed under the supervision of the Superior Electoral Tribunal, consist of a scaffold that provides for the automated transmission of results, digital signature and encryption of information. While the machines used in this country do not print the proof of vote, the fact that the machines are activated by biometric authentication is an advantage, as they can ensure one voter, one vote. In the United States, different voting machines and technologies provided by various companies like ES & S, Hart and Premier are used. They range from optical scanners with which the voter must complete the ballot paper and then pass through a scanner that reads his or her selection, to the most advanced machines touch screens that allow printing of receipt and record electronically the vote. There are other machines that to be activated, voters need to introduce a smart card (similar to a credit card equipped with a chip) and then vote. The selections are recorded in the internal electronic memory, but with no paper impression of the vote. Although in many elections the screen of a voting machine can be enough to complete the process, there are elections where the need to choose various candidates forced the use of a ballot. These instruments are used to list the options or candidates, but for a long time it was only a paper tool on which voters stated their will, and then were placed in an urn. In the last decade, since 2004 exactly, where it was first used in a national election (just in Venezuela), electronic ballots have been booming since they work in conjunction with the voting machine and are configured according to the electoral requirements, or as scheduled by the EMB. It is also a great way to bring automation to the idiosyncrasies of the voter. The Federal Electoral Institute of Mexico started research to implement an electronic voting system in several states of the country, including Chiapas. In November 2010 they submitted the electronic ballot in several locations. This ballot must be connected to the electrical current or in default to a battery; it has four options that can be selected by the voter by pressing on their choice, casting a small paper ballot that falls automatically into a transparent ballot box.